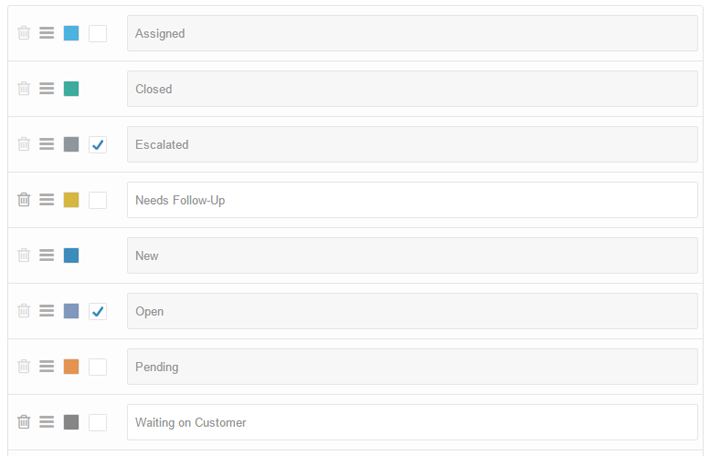 The ticket status list is one of the most important ticket properties in your helpdesk as it enables you to define the support process of your team. It also helps you to priorities and manage the lifecycle of a ticket from the time it gets added in your helpdesk, to the time when it gets updated or closed by one of your support agents. By default, each ticket in your Trakdesk account can be assigned one of 6 core statuses: New, Open, Pending, Assigned, Escalated or Closed. However, you can also create as many ticket statuses based on your business needs and use them to define the different stages in your support process. New - This is the default status of each ticket when it gets created in your helpdesk. It is also the most important status as it may require your team's immediate attention. Open - This is the second most important status to new as every time a customer replies to a ticket that has a different status, it will automatically move the ticket status back to open status so your agents can review the ticket again. This is done using the event trigger automation and can be modified as needed. Pending - Tickets can be moved into pending status when an agent is waiting to get more information from a customer. Assigned - When an agent assigns a ticket to another agent, the ticket is automatically placed into assigned status. The agent can then review the ticket and update it to its appropriate status. Escalated - When an agent moved a ticket from one group to another, the escalated status can be used so agents will be alerted that a ticket requires their attention. Closed - This status is used to mark a ticket as resolved. However, if a customer replies to a ticket stating that it is not yet resolved, the ticket will automatically be placed into the needs follow-up status via event triggers automation rules. This rule can be update to meet your needs at any time. Note: Default ticket statuses cannot be modified or deleted. An unlimited number of custom ticket statuses can be added that will enable you to extend the steps in your support process and also help you to organize your tickets better. Additionally, you can configure a color for each ticket status by using the interactive color picker and re-organize them to your preferred hierarchy by using simple and interactive (drag and drop) feature. You can also enable or disable your ticket statuses at any time with the exception of default statuses which cannot be deleted or renamed. By default, an SLA policy gets added to each ticket the moment it gets created in your helpdesk. This is used to notify you when tickets in your helpdesk requires your attention. SLA notifications can be enabled or disabled for each ticket status at any time with the exception of the closed status. To avoid such problem, you can create a custom status and disable the SLA notification so tickets that are placed into that status will not be violated regardless of how long your agents takes to resolve the issue. Setting up SLA notifications so nothing slips through the cracks. Select the Custom List option. Under the ticket section, click on Status. Click on the Add more button at the bottom of the page. Enter a name for the status and select a color using the color picker. Enable or disable the SLA notification based on your needs. Click on the Save Changes button once you are done adding the new statuses. You are done, your team should now be able to use the new statuses you have added.